Graduates of the programme will have the training to go on to work in numerous fields, including the conventional chemical and process industry (petrochemical, specialty chemicals, pharmaceutical), the wide-spread energy industrial sectors (up-stream and down-stream Oil&Gas, energy generation, green energy production), and many other specific sectors (material production, food technologies, industrial biotechnologies, etc.). Completion of the STEM Master’s degree can also lead to entering PhD. level studies. 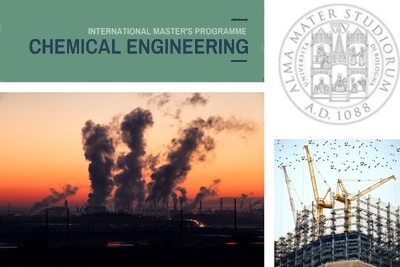 Call for applications for the Master's Degree Programme starting in September 2018: http://corsi.unibo.it/2cycle/ChemicalProcessEngineering-STEM/Pages/call-for-applications-academic-year-201819.aspx. The minimum graduate admission requirement for the Master’s Programme is a bachelor’s university degree of three years’ duration or gained through the acquisition of at least 180 ECTS credits or other degree from accredited institutions recognized as equivalent. Applicants are accepted with Italian or International university degrees which include a suitable number of university credits in fundamental subjects for chemical, materials or process engineering, together with appropriate corresponding grades. Evaluation of suitability of applicants’ degree and curriculum is performed by the Master's Board which decides about their admission to the Programme. For Non-EU citizens, an annual quota of places is set each year by the University of Bologna. For the STEM Programme, in the academic year 2018/2019, a maximum of 30 non-EU students will be accepted. Please note: no entrance exam nor Italian proficiency test are required for the Master’s Degree Programme in Chemical Engineering. A Master’s degree in Chemical Engineering is key to professional success in several modern and innovative industrial sectors. Smart materials, sustainable processes for energy production, industrial biotechnologies, and advanced pharmaceutical applications are only some of the examples of sectors where the expertise of chemical engineers is sought and highly rewarded. Furthermore, the conventional world-players as the chemical and Oil&Gas field are facing a context of increasing innovation and internationalization. a) Materials and biotechnologies option: advanced knowledge in materials science and engineering, polymeric and composite materials as well as advanced properties of materials. b)	Industrial Biotechnologies and Pharmaceutical Engineering option: advanced knowledge in biotechnological and pharmaceutical processes, equipment and operations.